For the overall information about this film, please refer to this page on imdb.com. I give tons of credit to Greg Bond, Jerry Crawley and Rob Inman for doing the research, compiling it and submitting it to me for this page. 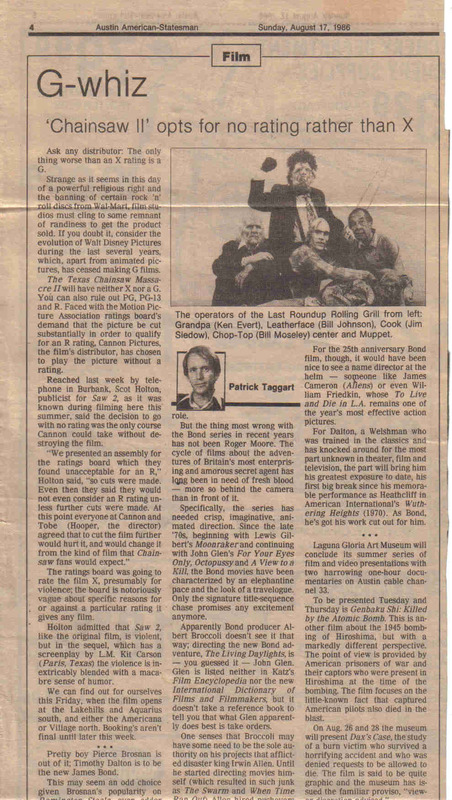 The following text was written by Jerry Crawley on the locations of TCM 2. For over thirty years, the movie, The Texas Chainsaw Massacre, has been a cult classic. 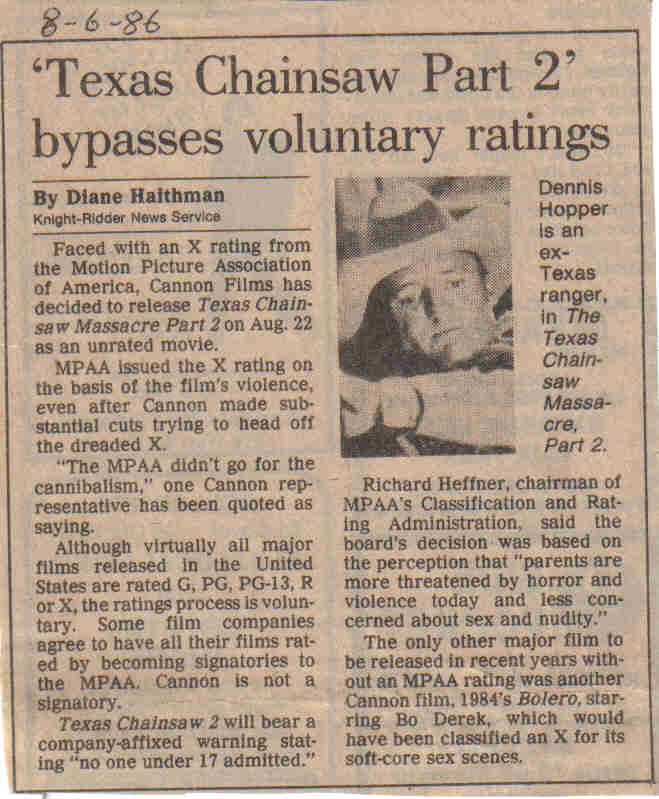 It has spawned 5 sequels including the Texas Chainsaw Massacre remake of 2003. The first movie is probably the best because of its originality, but there are several fans out there that seem to take a more passionate liking to the sequels. On a personal note, I think there is a special quality about each one of the movies that is both inspiring and entertaining. The Texas Chainsaw Massacre Part 2 is a very strange and unusual movie. I think that is what makes this film more interesting. It seems that in this sequel, there are no boundaries and no real moral values in the strange world of the killers. The saga of the original Texas Chainsaw Massacre continues as the family of cannibals return to wreak havoc. In the return of “Leatherface” the brother of two of the Victims (Franklin and Sally) from part one is determined to seek revenge on the killers. As Lefty searches for the demented family, he meets local radio D.J., Stretch, who sets out to help him in his search. Stretch gives Lefty a recorded tape of the teenagers who were killed by the cannibal family who called the station that night. As Stretch desperately seeks to help Lefty, she hesitantly agrees to play the evidence on the radio. Little does she know the killers hear the broadcast and come in search of her? Leatherface, and his brother Chop Top, decide to show up at the radio station and get rid of all of the evidence including the D.J. As Leatherface and his brother destroy the radio station, Stretch manages to escape into the cooler room. After finally making his way through, Leatherface quickly captures Stretch. But rather than killing her, Leatherface takes a liking to Stretch and decides to let her go. Even though she survives, she stupidly follows the killers. She follows them to a catacomb of caverns where the cannibal family lives. As the movie continues killing becomes fun and games and there is no stopping the madness. Innocent victims become dinner for the night and the screaming never seems to stop. 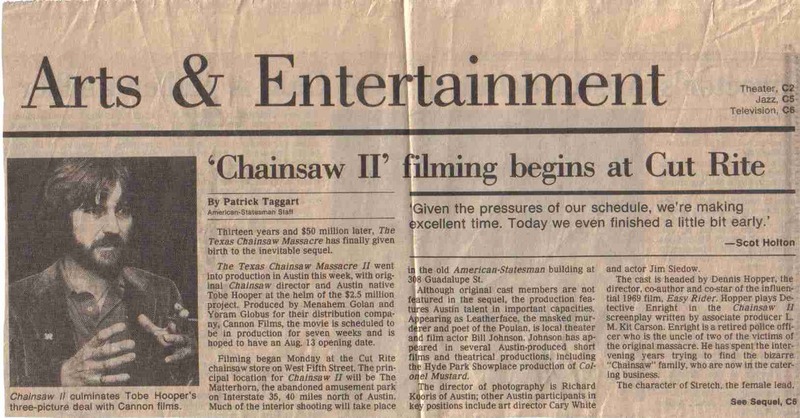 The Texas Chainsaw Massacre Part 2 started filming in May of 1986 and ended in July that year. The movie hit theatres a month later. The locations for this movie were picked very carefully for shooting. I visited these locations, and here is the information I found. The first location I went to was where Leatherface and his family lived. This was filmed in Jarrell Texas. Jarrell is located an hour north of Austin. 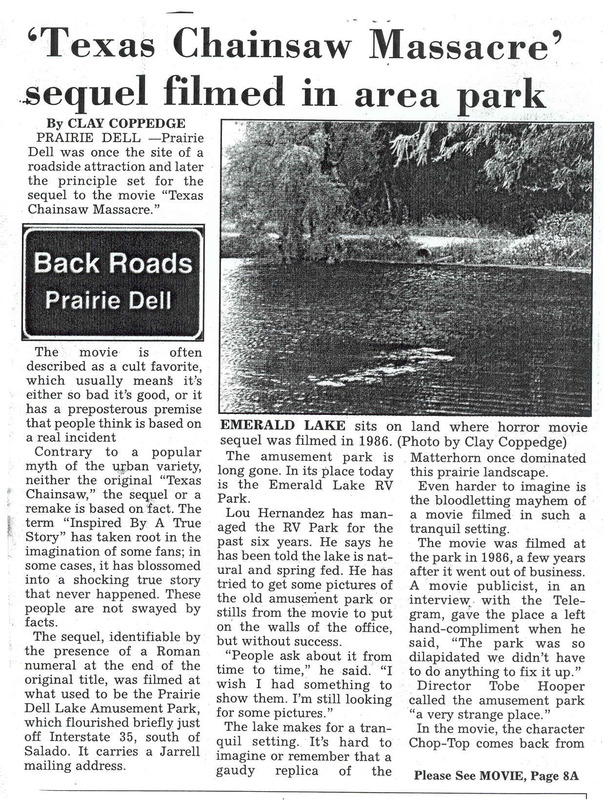 Prior to filming, the location was Prairie Dell Lake Amusement Park. The Park was opened somewhere between 1983-1984, but quickly went out of business after about a year. 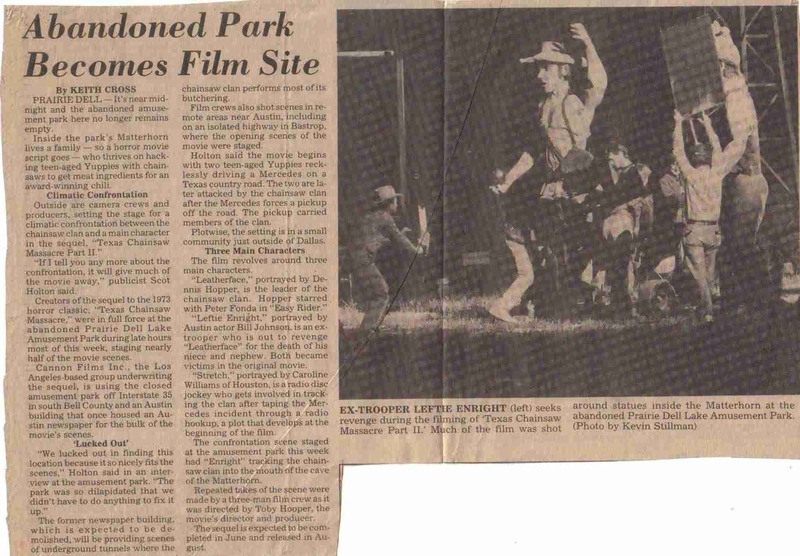 After the park closed, it was used solely for the purpose of the movie. The park was demolished sometime after the movie was completed. The site is now called Emerald Lake RV Park. I asked the Owner Betty Nastasi how it feels to be the owner of a place once used in the movie. She says “It’s very nice here; people come out here all the time and ask about the movie”. The RV Park is spread out over 4 or 5 acres of land. On site they have a swimming pool, a laundry mat, and different amenities. The manager’s office sits off to the left of the land, just in front of the lake. Currently, there is only one building still standing that resembles the inside of the caverns that you see in the movie. I was a little disappointed when I arrived to the film’s location, because there was not a whole lot on site that resembled any of the movie. I spoke with Betty Nastasi, the Owner of the RV Park, she was very excited about showing me around the site to locate some cool stuff she thought resembled what may or may not have been in the movie. The first thing she pointed out was the diving pool, which you don’t see in the movie, but was used for the amusement park. Strangely, the diving pool has risen out of the ground after many years of rain. The diving pool is located in back of the Office. Betty walked me over to a strip of concrete left over after the park was demolished. The concrete was used as the foundation of the parks most visible attraction, the Matahorn, which was the main set of the family’s house in the movie, but was a maze in the actual park. The concrete curves for several hundred feet and seems to be just right for something like that of the Matahorn. That is to our belief the only thing left of the Matahorn. If coming from Austin, you would exit Yankee Rd. The entrance where Stretch comes into the park with her Jeep is the first entrance off the service road. However that entrance is now closed off. The RV Park uses the next entrance. Near the entrance Stretch used, is a concrete slab with eight wooden poles where you see her in the movie, briefly stop and watch the killers enter the Matahorn. Although those poles are now cut, this is definitely the spot where she stood in the film. The beams Stretch is running under while being chased by Lefty is no longer on site. From looking at the movie I would suggest somewhere beside the caverns in where the beams used to be, but you know how movies can be edited, so who knows. The only other thing I saw on site was the railroad tracks that were used for the train in the amusement park. The amusement park also had a restaurant and a fishing lake in the back along with paddle boats, and go-carts. This would have been a cool place to hangout. It was also used as the parking lot to donate a car for movie use. The park is located @ 22612 S. I-35 Jarrell, TX. 76537. Coming from Austin, you would take Yankee Rd. Exit. Make a Left over I-35 get on the service road and go North and a few miles down past the flea market it’s on the left. 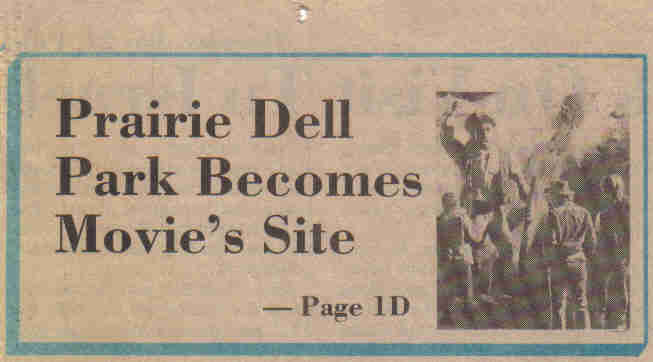 The next movie location was Cut-Rite Saws, which was where Dennis Hopper (Lefty) stops to buy three chainsaws. The building, located at Mopac and 5th Street, west of downtown Austin, still stands in its original place. The business was sold in early 2005 and is now known as Mean Eyed Cat, a popular neighborhood bar. This was an exciting location to visit, because a lot of it still resembles what you see on the movie. There are several changes on the inside and outside. For instance, the grass parking lot where Hopper pulls in is now a paved lot. In the movie where you see a band marching to the right of the building is still very much the same. Town Lake is located only a few feet in that direction so not much has changed there. The new business owner has also added a railing to the front entrance. Obviously since the business in now a bar, there are several big changes to the inside. As you enter the building, the bar in directly in front of you, but if you walk over to the left, you can stand in the same room Hopper picked out his three chainsaw. That small area is now occupied by a pool table. 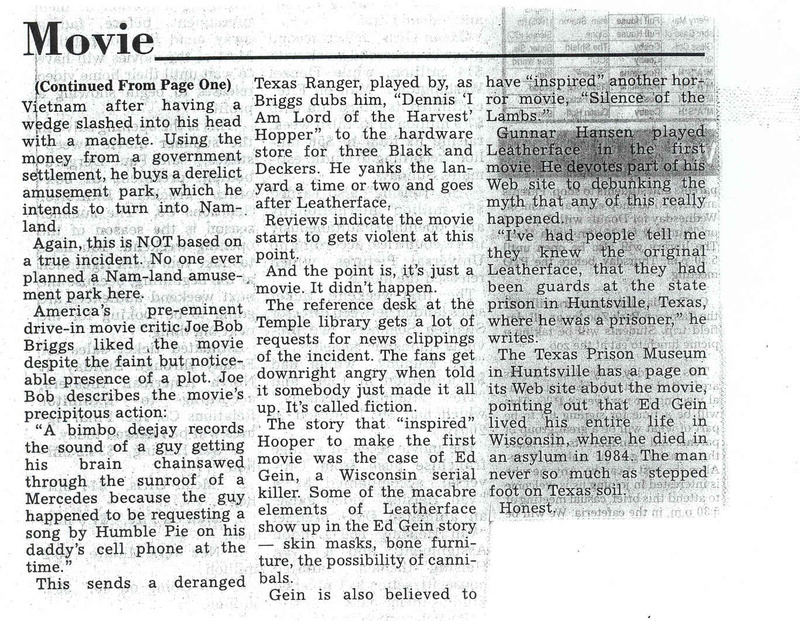 The owner has memorabilia of the sequel hanging from his walls. Here's a shot of what the Cut-Rite chainsaw shop looks like as of September, 2010. It's the Mean-Eyed Cat Bar. Photo courtesy of Shane Brown. #1, #2, #3 & #4.